My youngest has reached that point (ok - it was a while ago, but I'm just now getting around to showing you) where he's ready to eat solid foods. I like knowing exactly what is in my baby's food so I've always made it. Plus it is sooooo CHEAP! I usually start with orange vegetables. I read somewhere that they are easier to digest and aren't gassy. Throw them into a steamer basket and steam. You can also simply boil them, but they retain more nutrients when steamed. Once they're tender, about 15 minutes or so, throw them into a food processor or blender. I have this mini food processor that I've found is perfect. With carrots you'll need to add some water and blend until smooth. Place in containers for storage. I got this set for my first son and have been great. 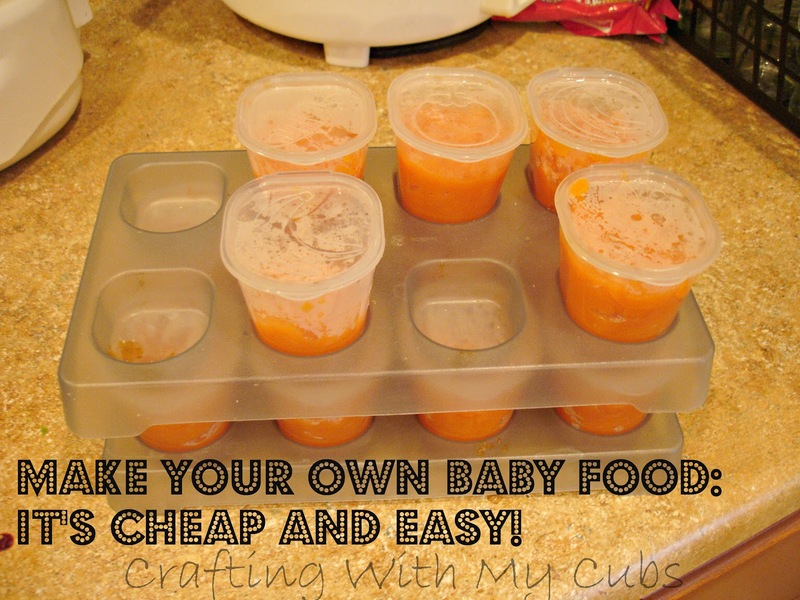 You can also use baby food jars that have been cleaned out. I made about a half pound of carrots and got 12 1/2 containers. The bag of carrots (organic) was .88 cents for a pound so that's about $0.04/jar! I'll be sharing more recipes through the week and as my little guy grows and we venture into new tastes so stay tuned for that! Thanks! Looking forward to the rest! You could also add breastmilk instead of water. I made chicken and carrots for my 8 month old the other day. Love your price breakdown. How do you store these? And for how long? I store them in the freezer until the day before I need them when I put it in the fridge to defrost. They'll last about 6 months in the freezer, but I always go through them so quick they're never there for long. And I don't typically let them sit in the fridge for more than about 5 days. I've got a ton more recipes on the recipe tab. I love making fresh and homemade babyfood. Let me know if you have any more questions!